On April 23rd, Bianca Jorgensen and I hosted the Haunted Library Panel Discussion at the White Mountain Library’s first WYO.CON in Rock Springs. Two of our wonderful volunteers Tiffany Kennah and Ursula Krentz joined us in helping to inform and educate the public on the subject of the haunted library in Green River. We provided a look at some of the amazing photos that the patrons have shared with us through the years. They included some of what we call the greatest hits, Man-in-top-hat, the Little Girl, Green Guy, Blue Mist & Lady with Dark Hair, The Bones with Charlie Love, and more. The photos always trigger many questions. It was great to see young and old asking. One gentleman had heard of stories and wanted clarification. We are always happy to explain each report to the best of our knowledge. The photo of the old city cemetery is always a big draw. The public has many questions about the land and the area in which it sat. There was good discussion and many did not know the story of the old cemetery being moved up the hill to what is now, the Riverview Cemetery. Also, many did not know that more grave were found as construction and stabilization began on the site. Two mass graves were dug and different times and are found in the current cemetery. A large pine tree and a lilac bush mark the two spots where the bones were re-interred. Some bones are believed to still be buried on the property. I personally, had been told by Alan Wilson, the previous City of Green River Supervisor for Parks & Recreation Department, that there are at least six graves remaining. The reason the graves were not moved at the times the others were, was due to the belief those that had died did so because of smallpox. The local citizens did not wish to take a chance in re-infecting the population. The Ghost Walk Volunteers tiffany and Ursula were great. When asked some of their favorite experiences, Ursula spoke about the ghost she has dubbed “Cowboy”. She first encountered him while helping with a ghost walk. The group was in the garage area. Library staff had been busy putting together a parade float that was western themed. An old pair of cowboy boots had been nailed down on the one side of the float. As the group and Ursula, particularly, passed by all the equipment went off. We stopped and she stood in front of the boots and began questioning the spirit. With KIIs in hand, it seemed she had a friend. For each ghost walk since, it seems her friend likes to come out and visit. There has only been one ghost walk that he stayed somewhat at bay, this is when Ursula’s husband attended. Apparently, he will only talk to her through the devices if her husband in not in the building. This gave everyone a good laugh. Tiffany spoke of all the interaction between the spirits and those of us that attend, whether staff or patrons. She mentioned that there is video evidence on Youtube from both P. I. Team of Utah and from the Sweetwater County Library. If you have the time it is worth a peek. I want to send out a special thank you Aaron Volner, staff member of the White Mountain Library, who put the event together. This was the first attempt and patrons seemed please. A special thank you goes out to Tiffany and Ursula for all they do for us. They have attended the ghost walks for years and they have become a pivotal part of enabling us to continue. 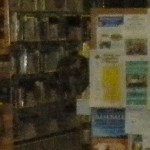 Those of you that follow my blog, know I truly believe there are spirits here at the library. Sometime they are busy keeping us on our toes and other times it seems quiet. For a few months now, it seems they have decided to be very quiet. 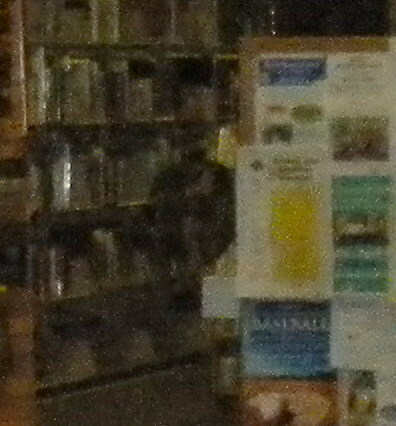 Through all the years I have worked at the library, I have seen three full apparitions, heard countless unexplained noises or voices, felt a hand touch my arm, and seen shadows at play in the stacks and other areas, and much more. This has become part of my work. Unless you have worked or lived in a haunted place, you will have no idea what I mean. Many times you see something out of the corner of your eye and then it is gone. It happens several times, but you find nothing. I think they like to watch us work and see what we are doing. Very rarely have I ever felt uncomfortable, but there have been a few unique visits. Once while I was hard at work, I was at my desk and was diligently working on the computer. The next thing I knew, I felt there was the sense of someone very tall and large stepping behind me. I had chills from head to toe. I didn’t turn around, but I knew “he” was there. I had no doubt. You know the feeling you get when a person is behind you very close. This was how I felt. I was on a deadline for the work I was doing. I decided I had to take charge. I said out loud and very plain “I have work to do and I am on a dead line, I would appreciate it if you would let me finish my work”. Nothing. No change. I said it again and added “I know you are curious about what I am doing but you need to leave and let me finish”. Two minutes later, I felt a gradual lightening of the air and he was gone. I have never felt his presence since. As I stated, it has been a bit quieter for several months. I does make you wonder if they left for Spring Break. I catch myself listening or looking just a bit to see if I am missing something. I seems they determine when and if they will visit. I did however have one startling thing happen. Towards the end of February a staff member stopped by to ask the rest of us if we smelled smoke. We always check the building when this happens of course, but found nothing. She is not a believer in the paranormal. I seemed the smell moved and may have been following her. She walked from the Front Desk area threw the back room into the hallway. Just as she got into the hallway and to the bottom of the back staircase, I heard just to the side of my desk by the hallway door “Uh-hum Hello!). It was plain as day. It was a woman and older girl’s voice. I was so startled, my head whipped around to see who was there. There was no one. I heard this with my own ears. Unfortunately, no one else was in the room. To answer my own question, “Are they gone?” I say no. I think as always, they choose when, where, and if they will pay us a visit. When you least expect it……………………..Boo. The Sweetwater County Library System has reserves rights to all content. Do not copy or use in any way, any of the content without written permission form the host. Powered by WordPress with jd-nebula theme design by John Doe.